The Historic Savannah Foundation (HSF) will present its 2007 preservation award on October 30th to the Savannah College of Art and Design (SCAD) for its restoration and adaptive reuse of the former Congregation B’nai Brith Jacob synagogue. The 2008 HSF Annual Meeting and Preservation Awards to be held at the restored building, which has been adapted for use as the SCAD Student Center. I visited the building when it was still under construction, and have not seen the project finished, but here is some history about the structure, the congregation and the architect. The former synagogue at 120 Montgomery Street, was built in 1909 and served the Orthodox Congregation until it moved to its new building in 1962. It was later home to Saint Andrew’s Independent Episcopal Church, from 1970 to 2002. SCAD acquired the building in 2003 and began work on a new student center designed by Jairo Delgado Associates and constructed by the Carson Construction Company. The Center was opened in 2006 after a process of renovation and restoration. While HSF states that the “the Moorish Mediterranean style revival architecture was based on the 1870 Central Synagogue in New York City,” this is only true in the most general sense. 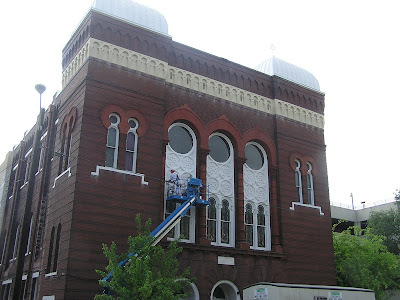 The Moorish style became popular in America after the Civil War and large urban (and frequently illustrated) synagogues including the Isaac Wise Synagogue (Plum Street) in Cincinnati (1866), Temple Emanu-El in New York (1868), and Central Synagogue in New York (1872) all helped to popularize the style. In America, the style was embraced by Jews as being up-to-date, progressive and appropriately Jewish. Orthodox congregations, however, were slower to adopt the style and it only became common in Orthodox circles, mostly of post-1880 East European arrivals, one and even two generations after its introduction. The Eldridge Street Synagogue (1887) and Zichron Ephraim/Park East Synagogue (1889-90) in New York were among the first. In Georgia, the Orthodox Congregation Ahavath Achim (Atlanta) built an exotic, if not quite Moorish, synagogue in 1901, with west towers and domes similar - but more dramatic - to B’nai Brith Jacob in Savannah. By that time, most American Reform congregations had moved on to other styles (especially the Classical and Renaissance styles after 1896). The 28,834-square-foot, four-story, boxy-looking synagogue was designed by South Carolina born Architect Hyman Witcover (1871- 1936), who in his lifetime was one of Savannah’s most successful and prolific architects. He was also one of the first American-born Jewish architects practicing in the United States. Witcover purportedly had an Orthodox Jewish background, was a member of the Young Men’s Hebrew Association in Savannah during the 1890s, and 1904 he joined Congregation Mickve Israel, Savannah's Reform congregation, and in the 1920s served on its Board of Adjunta. Among Witcover’s other Savannah buildings are the Public Library, the Chatham Armory at the corner of Bull Street and Park Avenue, the Knights of Pythias Castle Hall on Telfair Square (demolished), Hick’s Hotel on Johnson Square (demolished), the Jewish Educational Alliance on Barnard Street, and the Lewis-Kayton House on Drayton Street. He was also an active Mason and designed the Scottish Rite Temple at the corner of Bull and Charlton streets. He designed and consulted on the designs of Masonic temples throughout the United States including temples in Charleston, South Carolina (where he was born); Montgomery, Alabama; and Jacksonville, Florida. A closer look at Witcover's work might point to stylistic and symbolic relationships between American synagogue and masonic temples. Most of the Jewish liturgical furnishings and fittings were removed from the building when B’nai Brith Jacob moved to its new home, a modern building at 5444 Abercorn Street. The Ark, bimah and eternal light are all installed in the chapel of the new synagogue. Benches and the old chandeliers are in the social hall. The new building is best known for the east wall of its sanctuary decorated with two 30-foot murals depicting the symbols of the 12 tribes, historic events from the Bible, symbolic images for each Jewish holiday, and images of Jewish ritual objects (At the time of this writing I do not know the name of the architect and artist of the 1962 building). Congregation B'nai Brith Jacob was organized in 1861 under the leadership of Rabbi Jacob Rosenfeld, establishing a place of worship in Amory Hall. In 1866, the congregation built a wood frame building on the northeast corner of State and Montgomery Streets. Plans for a new and larger synagogue at the same site were made in 1907 and the building was dedicated in 1909 at a cost of $45,000. Since that time the congregation has remained one of the largest, most vibrant and active Orthodox communities in the American South. The mission of Historic Savannah Foundation is to preserve and protect Savannah's heritage through advocacy, education and community involvement.